Are your kids clamoring for a pet? Do they see celebrities carrying around little dogs in their purses and just *must* have one too? Well, now they can! 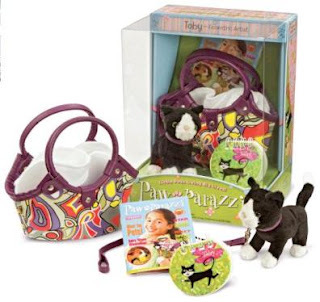 With Noodle Head's Pawparazzi Pets, you get a tiny plush dog or cat and everything you'll need to be a "real" celebrity pet owner (a purse, leash, collar, blanket, celebrity magazine, matching mini note pad, and a pop-out trading card). You can also buy accessory packs such as Day at the Spa, Dream Birthday, Flower Fairy, and Winter Holiday to dress your pet for different activities. We were sent Toby, a successful and passionate artist cat. I've actually always wanted a cat that looked just like this...black and white, cute face, long tail...but my hubby is allergic, so this is the best I'm ever going to get. The twins are a bit too young to play with this, since it's for ages 4+, but that doesn't mean I can't enjoy it for them for a little while. The cat is small enough to fit into her mini purse and is the perfect size for a little kid to tote around. She is soft and adorable, and I wish I could turn her into a real cat. We were also sent the Day at the Spa accessory kit, which includes a terry robe, slippers, eye mask, tote, and towel. So now my little Toby is all ready for a relaxing day at the spa, and boy do I wish I could join her there! This is such a great toy for kids who love animals and would love to have a pet. It allows them to carry their pet around, unlike a real cat or dog, and you don't have to clean up after it or take it for walks. It's also much less expensive than owning a real pet. It's a fantastic gift idea for young kids, and I would highly recommend getting one! Overall: We give Pawparazzi Pets a 9/10! One very lucky reader will win their choice of Pawparazzi Set (Indy, Misty, Toby or Daisy) and their choice of Celebrity Pet Dress Up Set! First, visit the Pawparazzi Pets website. Then, comment here and tell me which pet and accessory pack you would choose if you won. 2) Follow @Pawparazzi on Twitter and comment here with your Twitter screenname. 5) Become a fan of Pawparazzi Pets on Facebook, and be sure to let them know that The Twinners sent you! 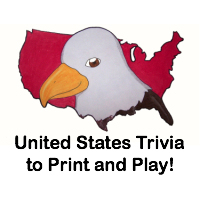 This giveaway will close on September 22, 2010 at midnight. We were sent the Pawparazzi Pet sets free of charge for the sole purpose of this review; no other compensation was received. All opinions expressed are my own. I joined your baby pool using the name Amber. I would choose Misty and the Holiday Dress Up set! facebook fan of The Twinners! I would want Misty and the Dream Birthday set. I like pawparazzi on FB. I like the Twinners on FB. My daughter would love the Toby set with the Flower Fairies dress up. Indy is the one I would get for my grand daughter and she just love faries so I would get that set. I like Daisy and the flower fairy set. entered your baby pool under Shannon N.
Toby and the Flower Fairy would probably be my choice. I am follower #165 on your personal blog. We love Pawparazzi in this house! If I was lucky enough to win, I would choose Indy with Celebrity Pet Dress Up Set - Winter Holiday.